This is a sound reflector that a good friend of mine has designed and made. We had looked at most of the ones on the market but they were either too fragile or too expensive, so Neil came up with the answer for me. I have used mine for more than a year now, both for myself and for my students (many who have purchased their own). It was originally intended to reflect my playing so that I had an idea of what I sounded like. If, like most people you stand in the middle of a room, it is suprising how much of your core sound is lost before it bounces off the wall and back to you. You could always stand and play against the wall, but in my house that is dangerous as the only available wall in the music room is by the door. I don’t fancy losing my mouthpiece down the back of my throat. The other down side to this is that if you need to look at the music at the same time as listen then you cant get the stand close enough to the wall and still be able to see properly. I use mine both for practising and for gigs. I play lead alto in a big band and with the reflector I can hear myself over the top of the other 20 players without having to turn myself inside out to do it. This means that I don’t start playing out of tune and get filthy looks from the band leader. The more I use it, the more things I find it helps me with. because the sound is bounced back to you straight away, you can hear if the notes have the same quality as each other. You can hear if your fingers are working as a team or not (even by the smallest amount). You can practice your dynamics more accurately and see that your crescendos or diminuendos are a gradual increase or decrease rather than soft at the beginning and louder at the end, but with no idea of how you got there. 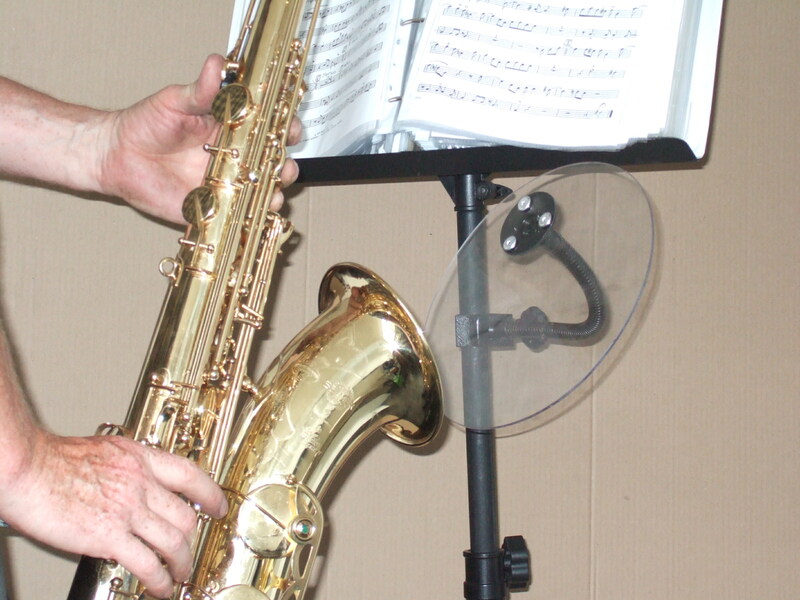 It can also be attached to a microphone stand if you don’t use music on a gig and it also works really well lower down the stand for playing clarinet. As I think you can gather, I am very pleased with mine and I whole heartedly recommend them. If you want one they are priced very reasonably at £24.00 plus £2.50 p& p, then you can contact Neil by email at neil@oxendon.fsworld.co.uk and he will be only to happy to help you out. I think the more you use one, the more you will find ways to use it even more, and if you find a way that I haven’t mentioned then please let me know. The Sound reflectors have had a sudden resurgence of interest. If you double click the photo above you will see it better. There is another version on ebay for a cost of £34.99 including postage, show this shows how good value ours is. Contact me if you are interested.